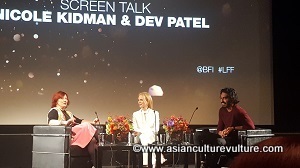 SUPERSTAR Nicole Kidman and top guy Dev Patel both charmed the audience at today’s London Film Festival screen talk, with Patel saying “Lion”, the first film the two have done together, has been the most rewarding, emotionally for him. The film got rave reviews when it premiered in Toronto last month and is quite a ride (see review at bottom). 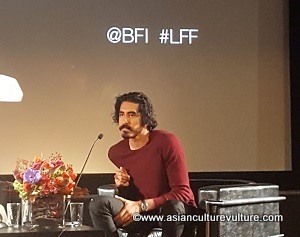 Patel also told the packed theatre at the British Film Institute (BFI) Southbank this afternoon that he had to shape up for the part of Saroo Brierley, the Australian on whom “Lion” is based and that the part was the closest character to his own on a personal level. He said the part reminded him on his own re-connecting with Indian culture after growing up, effectively shunning it. Both Kidman and Patel talked about actually meeting the real family and how impressed they were with both Brierley and his Australian mother. Patel also talked briefly about a film he is working on (thought to be called ‘Hotel Mumbai’) based on the 2008 terror attacks in the City, and how important it was personally for him to make such a film. He also said that he is beginning to write and expressed the ambition to play a part he has written for himself. 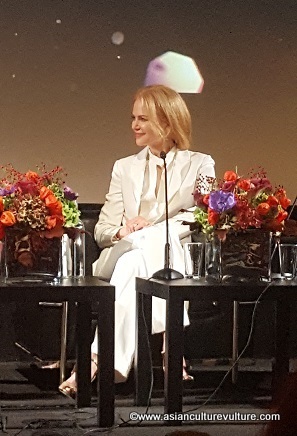 Kidman talked about the directors who have made a big impression on her, how much she wants to do a screwball comedy and how “Lion” played to her maternal instincts as the real life mother of an eight-year-old daughter. The film gets the Red Carpet treatment this evening at the festival with Australian Kidman and British Asian Patel both given star billing. Based on the real life of Brierley, “Lion” which is directed by fellow Aussie Garth Davis, charts the tale of a young boy who messes about at a railway station with his brother and then finds himself on a train travelling a thousand miles away from his home in India. He is adopted by an Australian family and as vague memories continue to accrete feels compelled to return to India to find his biological family. The film also stars Rooney Mara as his Aussie girlfriend. Clare Stewart, the director of the BFI London Film Festival, said it was an “emotional” film and that she was determined to bring it to the festival. As chief inquisitor, she cast a critical eye over the pair’s film choices, showed clips and one half of the talk was taken by films they have both done in the past. Patel described how he had come off the back of playing the Brahmin Maths genius Srinavasa Ramanujan in “The Man who knew Infinity” with “big ears and short hair set back” and onto the set of “Lion” and Davis told him to grow his hair and “go to the gym and turn into an Aussie”. Earlier Patel had talked about how much he had identified with Brierley. “I am so proud of ‘Lion’, it is the perfect blend of what I’ve been striving for. I am playing an alien (a foreigner), the closest thing to myself. He is Australian, born in India but has no real connection to that country, and goes back like I did to discover it (what he had to do for “Slumdog Millionaire“. He told the audience that working on the Hotel Mumbai project was a personal act of solidarity with India and the people of Mumbai. He said he did not want to play a similar part as he had done in “Slumdog Millionaire” and so is Sikh hotel worker in this film. “It changes everything, the way you dress, the way you speak,” he elaborated. Kidman said she loved working with Stanley Kubrick. They made “Eyes Wide Shut”. She said her daughter liked to make people laugh and it had rubbed off so much that she said she was very open to appearing in a screwball comedy. Stewart quizzed her closely on her performance in “The Hours” as the great early 20th century writer, Virginia Woolf, for which Kidman won an Academy Award. The audience were shown a clip where Woolf demand she return to London, having been exiled to Richmond (it isn’t clear whether that is Richmond in Surrey or Yorkshire) but one thing is – Woolf said she preferred death to staying there. “It’s David Hare’s words. It was just a joy to play,” Kidman said. Both disclosed they learnt a lot from the writers, especially if there were still involved in the production. Patel said he felt privileged to work with Aaron Sorkin, who also penned the much acclaimed and multi-award winning TV series, “The West Wing”, as well as “The News Hour”, which Patel starred in. *Lion shows tomorrow (Thursday) and Saturday at the London Film Festival as well as this evening’s red carpet American Express Gala screening. LET’S get this out of the way at the very outset: this is a great story. It’s emotional and affecting and Dev Patel as the adult Saroo is in fine form, as is Nicole Kidman -his Aussie mum in this – but the real star is Sunny Pawar (above) who plays the little Saroo and dominates the screen for much of the first segment. Cute and with a kick of a smile, his natural acting and expressive face make it hard not to feel for him or his journey. Based on the true story of Saroo being lost in India and then adopted and going back to the country of his birth, this is about real people and real emotions. When we move from the young Saroo and onto the older Saroo, the film changes pace. In fact, slow and methodical, it builds a new set of emotions, most principally between the adult Saroo and girlfriend, Luce (Rooney Mara) and Saroo’s new mother, Kidman. The early India scenes are beautifully constructed and the outsider’s eye in Aussie Garth Davis’ direction adds another superb layer to the film. All in all, this is very solid, and the finale is very finely executed – but somewhere in the Australian part, the film seems laboured and too self-conscious – especially against the backdrop of the slum boy’s life with its beauty (in family relationships), horror (in eking out a living, especially as a rag picker) and tragedy (in separation). Thanks for the purpose of offering such amazing articles. Exceptionally individual pleasant website. Immense information readily available on couple of clicks on.